Welcome to CarpetCleanerMachinesReviews.com where we publish reviews of the best carpet cleaner machines to help consumers get the most cleaning power for their money. This site provides reviews and guides to help consumers learn about the best carpet cleaning machines for home use. Our readers include lots of pet owners who deal with tough and frustrating pet stains, and ordinary families or singles who have to deal with the realities of keeping their carpets clean. Here are some getting started guides: Home Carpet Cleaning Machines Introduction & Carpet Cleaning Machine Buyer’s Guide. It is often time-consuming to search out and compare the best machines on your own. Top manufacturers like Hoover or Bissell have lots of cleaners that appear similar but they have different design subtleties and combinations of features that differentiate their performance and handling. This site allows readers to quickly understand the pros and cons of each machine. First-time visitors could browse through a list of the top machines below, and use the Compare Carpet Cleaning Machines chart. For readers who are in a hurry to see the best home carpet cleaning machines in the market today, here is a list of machines for regular domestic home use. If you prefer a professional grade machine for heavy duty performance, check out the Bissell Big Green Deep Cleaning Machine 86T3 review or Rug Doctor Mighty Pro X3 Review. [Best Quality] The Rug Doctor Deep Carpet Cleaner is Rug Doctor’s upright carpet cleaner for home users. This Rug Doctor deep cleaner model provides near-professional quality results, and at the same time is less expensive and lighter in weight than Rug Doctor’s regular commercial rental machine. 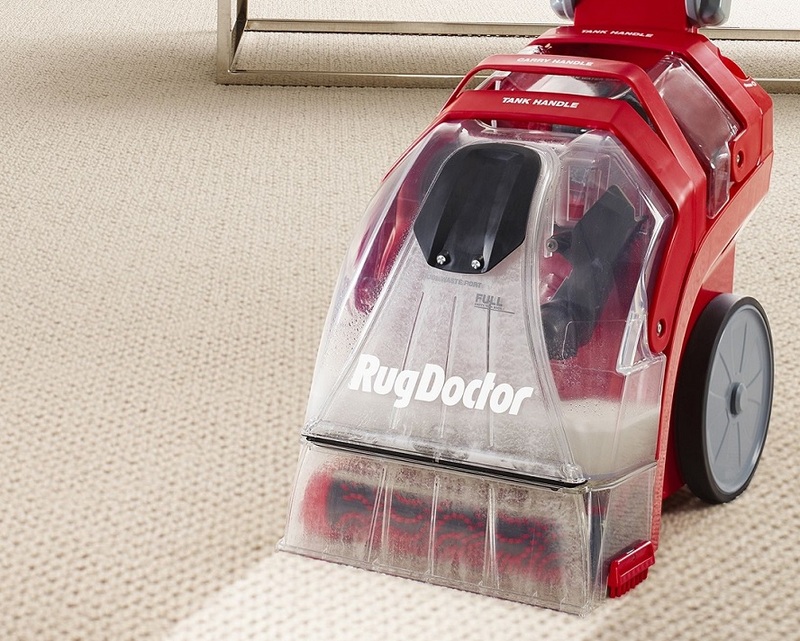 Rug Doctor asserts that this model’s suction power is up to 75% better than similar at-home upright cleaners, leading to superior cleaning results. A large number of users, including pet owners and others dealing with dirty carpets, are highly impressed by what this cleaner can do. Users like both it’s powerful cleaning capabilities and the quality of it’s construction and workmanship. One drawback is that it costs more than other popular models, but it’s better built than the average consumer grade model on the market these days. [Best Value] The Hoover Carpet Basics Power Scrub Deluxe Carpet Washer is a high-performing all-in-one carpet cleaner model that can be used for cleaning carpets, area spots and stains, pet messes and upholstery. It weighs a mere 18.1 lbs, making it one of the lightest full-powered (10 amps) upright carpet cleaner that delivers high quality results. Users are impressed with how clean their carpets get with this machine. 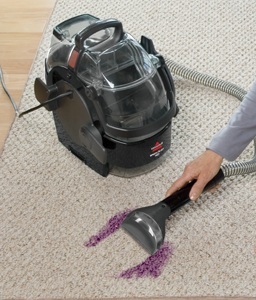 Many find that even light carpets with dark stains are no match for this powerful machine. [Best Features] The Bissell ProHeat 2X Revolution Pet Carpet Cleaner is a stylish and high-performing carpet cleaner. With this machine, Bissell’s engineers have incorporated some of the most desired features for a home carpet cleaner into a new lightweight and polished design. Their efforts are paying off, as user feedback has been very positive regarding this model’s ease of use and superior cleaning performance. [Widepath Cleaning] The Hoover MaxExtract Dual V Carpet Cleaner is highly rated for its powerful cleaning performance that rivals top Hoover models. What differentiates this machine is that is has a wide cleaning path compared to the Hoover Power Scrub, so that more of the carpet gets cleaned which each cleaning stroke. Another feature users like is the rinse-only mode, which makes it easy for users to rinse their carpets without having to empty their tank of water mixed with detergent. This is especially great for pet owners or users with young children who do not want the chemicals from the cleaner to stick to their carpets. [Powerful Classic] The Hoover Steamvac With Clean Surge F5914-900 is well-known for its powerful cleaning performance, ease-of-use and value price. According to users, this machine offers substantial cleaning power that literally stands up to the results of professional grade machines, but without the cost. Whether it is tough stinky pet stains like poop and urine, coffee stains or aged spots that have set in, it has been known to lift them off without too much trouble. [Has Internal Heater] Some shoppers specifically look for a deep carpet cleaner that incorporates its own water heater. 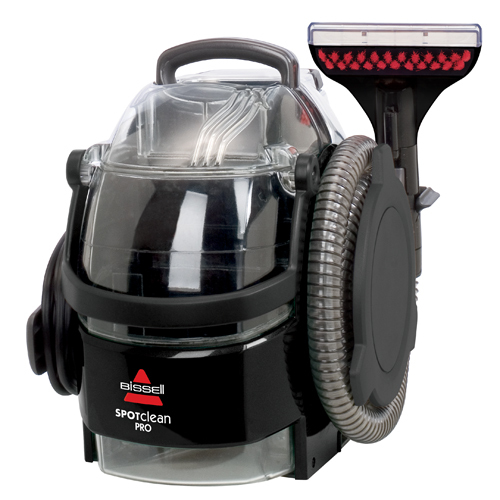 If that’s a feature you value, the Bissell ProHeat 2X Deep Cleaner is a very popular option with great user ratings. It’s also one of the few options available for an at-home cleaner with a water heater. Even without using the heating feature, this Bissell machine is well-equipped with double Dirt-Lifter brush rows and a powerful suction to deep clean carpets. It appeals to both pet owners and non-pet owners alike. Users are often impressed with how quickly it can clean out bad carpet stains and soiled carpeted areas. The Hoover MaxExtract 60 PressurePro has been engineered to provide an upgraded cleaning performance. For users with really dirty and stained carpets, its special Pressure Pro cleaning feature directs a wall of pressurized water to loosen and lift the most stubborn dirt and stains. When used in combination with Hoover’s proven SpinScrub counter rotating brushheads and strong suctioning technology, many users found its cleaning performance to be excellent. Users also like that the machine is well-constructed and solidly built to last. The Hoover MaxExtract Dual V All Terrain Carpet Washer F7452900 is an enhanced version of the Hoover MaxExtract Dual V F7412-900 listed above. Like the Max Extract Dual V, it is a widepath carpet cleaner with that cleans exceptionally well. It includes two important premium features that the Max Extract Dual V does not have: auto-rinsing and the ability to clean hard floors. Auto-rinsing makes it faster and easier to remove carpet detergent residue. A squeegee attachment that comes with the package turns this machine into a hard floor cleaner as well, making it easier for users to tackle and deep clean grimy floors. The Bissell ProHeat Pet Advanced Carpet Cleaner 89108 is one of the few home upright carpet cleaner models that comes with a built-in water heater. Besides being able to heat water up to 25°F higher, this Bissell machine is equipped with Bissell’s proven Dirt-Lifter brushes for lifting off embedded carpet dirt. The Bissell 89108 deep cleaner also includes a rinse-cleaning mode, whereby the cleaner only applies clean water for carpet cleaning, without mixing in detergent. For pet owners and homes with young children, the removal of detergent and chemicals from carpets is a worthy area of concern. The Bissell DeepClean Premier Pet Carpet Cleaner 17N4 is Bissell’s very effective carpet cleaner with special pet stains cleaning features. It has advantages over the more basic Bissell 8852 ProHeat cleaner, such as incorporating a built-in pet hair basket to catch pet hair and more brush rows. This Premier Pet model includes 12 rows of DirtLifter rotating brushes for deep cleaning, compared to 6 rows in basic Bissell carpet cleaners. The DirtLifter brushes, together with Bissell’s proprietary Heatwave technology that maintains the temperature of warm water temperature, maximizes the cleaning effectiveness of this model. The Bissell DeepClean Deluxe Pet Carpet Cleaner 36Z9 is Bissell’s premium carpet cleaner model for pet owners. Compared to Bissell’s other cleaner models, the Pet Carpet Cleaner 36Z9 contains a number of additional features specifically intended for pet stains. Highlights include a brushing mechanism with 12 rows of DirtLifter brushes, Heatwave technology for keeping water temperature warm, a CleanShot feature for tougher stains, a Pet Stain Trapper tool for gross pet stains and a Pet hair collector basket to prevent hair from jamming the insides of the machine. 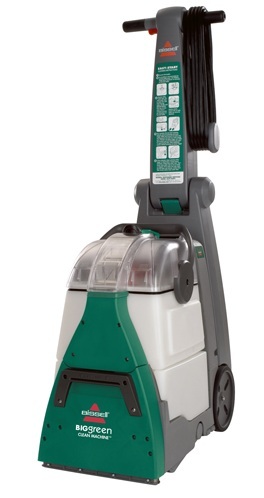 This machine is fully equipped to allow users to effectively handle pet stains on carpets with ease. The Bissell 8852 ProHeat DeepClean Essential Carpet Cleaner is Bissell’s basic low-priced upright carpet cleaner. It’s overall design and engineering incorporates essential features for a quality and convenient carpet cleaning experience. Users are often astonished by how easy it is to use the machine and how well it works in getting their soiled carpets thoroughly cleaned.